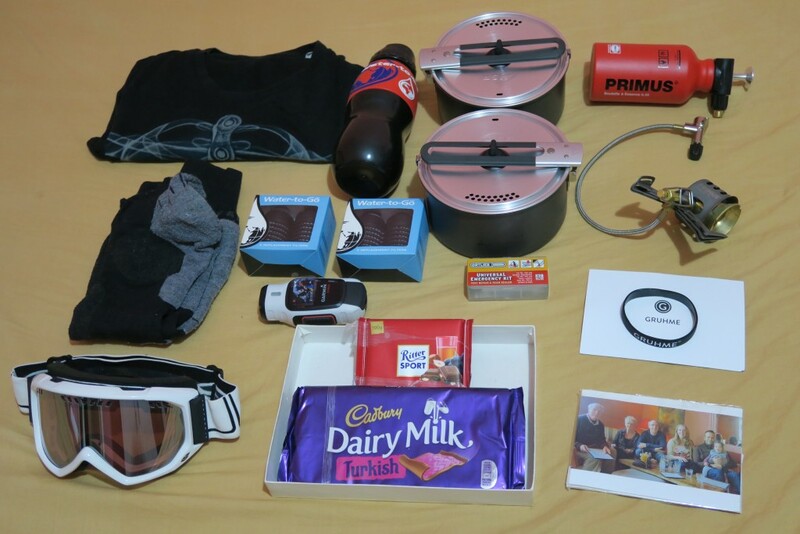 IS THIS THE ULTIMATE WINTER CARE PACKAGE? These things just arrived in the post for me today to help get me through the Turkish winter. I feel like Christmas just came early. 3) A absolutely ridiculously tiny stove – thanks to Tim Moss at the next challenge for the recommendation! 7) A Tshirt I left in Macedonia – I now have 2 T-shirts. This is exciting! 8) A super Water to Go bottle that will let me drink from rivers, taps, puddles, pretty well anything apart from sea water. and 11) and a rubber bracelet from the nice people at Gruhme (they make aftershave – I could probably do with some of that too to improve my overall smell!). They have asked for a photo wearing the bracelet from every continent in exchange for some food and drink money to keep me going. I’ll do (pretty well) anything for a free kebab and coffee! Thanks for the early Christmas everyone! Looks like a Primus OmniLite Titanium, sir. Excellent choice! Enjoy the Turkish winter. No doubt the cold will provide yet more incentive for the locals to invite you in! That’s the one! All thanks to your super (thorough) article comparing all those stoves! It’s crazy small and light. Perfect for reducing my load as much as poss. I am sure they will. Their reputation is legendary and our own winter cycling experiences provided plenty of support for it. Have fun!